I Did Karaoke With Two of LA's Best Chefs. Here's What Happened. Spend enough time hanging out with chefs and you'll learn a couple of truisms: first, the job is far more daunting and time consuming than it looks, so any time off to party is not taken for granted. Second, for many of them, music is nearly as important as food. The latter's especially true for Bruce Kalman, the critically acclaimed, award-winning chef behind Union in Pasadena and Knead in Grand Central Market, and Duff Goldman, who is best known as TV's Ace of Cakes and the mastermind behind Charm City Cakes. Both are also partners-in-rock in the punnily named grunge-and-more cover band Foie Grock, which is why when an opportunity to spend some of their precious time off with them doing karaoke fell into my lap, I took it. The Den on Sunset is one of those bars, like many on the strip, that seems like a beacon for LA newbies: its underground entrance gives it a lair-like feeling, but its proximity to fancier spots like the Chateau means that overflow from red carpet rejects is inevitable. Though I've never met him, it's not hard to find Goldman: his trademark bald head glistens with sweat as he hides himself in the back corner of the bar, anxiously poring over the massive songlist and taking notes on a little notepad while his girlfriend looks over his shoulder. He's clearly nervous about this, which surprises me since he's both a TV personality and seemingly gregarious. His hand-written notes have both classic karaoke staples ("All Star") and more out-there options ("Teenage Dirtbag"). "It's my first time doing karaoke since I was, like, 13 years old," Goldman tells me. I'm shocked. Kalman walks in from the back room, joined by a young cook who works with him. "Man, I'm excited to get out," he tells me as we bro-hug. "I think I should clear the bar and do 'Stairway to Heaven.'" We laugh and I tell him I used to dread that song when I hosted karaoke. "Everyone forgets about the 3-minute guitar solo," I say. "You get to it and it's a bunch of people looking around waiting for something to happen." Goldman looks concerned that he may make the same mistake, even though his list has no glaring karaoke disasters. We discuss how "Piano Man," though it's a no-question classic, goes on for about four minutes too long; "Bohemian Rhapsody" only works in a large group -- so no one can hear that you can't hit the high notes. "Piano Man," though it's a no-question classic, goes on for about four minutes too long; "Bohemian Rhapsody" only works in a large group -- so no one can hear that you can't hit the high notes. Kalman's clearly in the zone as we walk up to the front of the bar, where karaoke's already started. A broad smile is on his face as he goes and has a discussion with the KJ, sporting frosted tips, a permagrin, and a tie that doubles as a washboard, which he plays generously as a pair of women sing "Girls Just Want to Have Fun." We smalltalk for a bit; Goldman tells me that the band came together after he and Kalman met at a Fourth of July party. "I was scared to jam," he tells me, but Kalman got him out of his shell. Eventually, the jock calls Kalman's name. He gets up and a song that Foie Grock plays, the Foo Fighters' classic, "Everlong," kicks in. Kalman crushes it, his vocals mimicking Dave Grohl's howl, putting as much passion into it as he does into every plate of pasta at Knead. He walks back to us. "So... what are you going to sing," he asks Goldman. I find out more: Goldman used to play bass in an Elvis cover band, doing hot-rod rallys as pinup girls danced on the sides; it's not hard to picture him as a retro-rodder, rocking into an upright bass for guys who have the whole Reverend Horton Heat catalog. He hates -- HATES -- when someone calls him the Cake Boss. "I hate that guy," he says, with no reservations. "The next time it happens on a morning show, I'm just going to walk off." It's not a feeling of bitterness, though, it's owning who he is. And when the KJ finally does call his name, there's a visible change in Goldman, and it becomes clear that going out with him isn't just about having a few drinks or doing karaoke, it's the same thing that happens with anyone who's a public figure: as he steps up to the mic, he gets recognized, and all of a sudden the pressure is actually on. Girls want pictures with him first; the KJ asks me to snap one as well. Goldman's song -- the only one he'll end up singing the whole night -- comes on, and it's completely unexpected: Simon and Garfunkel's "Mrs. Robinson." He lights up as he sings it, nailing the lyrics without looking at the screen. He's not just a karaoke singer, though, he's a celebrity, and -- in as egoless a way as is possible -- he knows it, looking at cameras as they flash while he sings through the song. He finishes, and walks back to us, drink in hand. "That was great," I say. "Thanks, man. But I'm really just a bassist." "12:35am: Kalman: Ate at [not legible] molecular gastronomy in drinks -- "'it's good if you can [not legible].'" Clearly, for all of us it was a successful chef's night out. 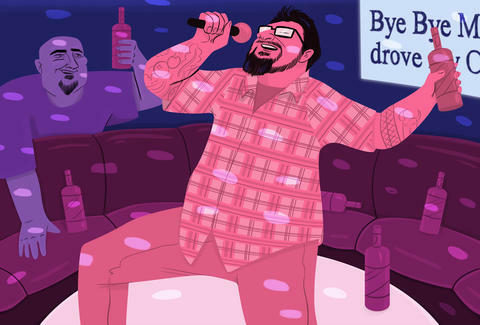 Jeff Miller organizes Thrillist karaoke trips every time he goes to NY. Laugh at photos from them at his Instagram.